I’ve been working up to the inevitable London Plane (Platanus x acerifolia) post for some time but this, you may be pleased to know, is not it. 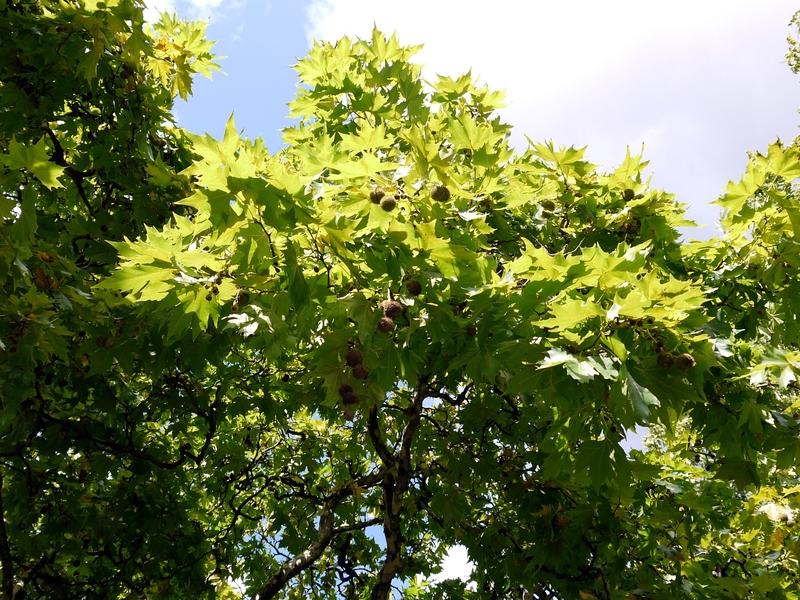 Instead I’d like to compare notes on one of it’s parents, the Oriental Plane (Platanus orientalis). Two examples of these relatives of the acerifolia (Maple-leaved) tree inhabit Brunswick Square Gardens in the heart of Bloomsbury next door to Coram’s Fields and the fascinating Foundling Museum. These gardens are what remain of an undoubtedly fine Georgian Square noted as the fictional home of Mr. and Mrs. John Knightley in Jane Austen’s ‘Emma’. Now they are surrounded by more modern developments: no buildings of those romantic days survive and the small public park that is now Brunswick Square Gardens is managed by Camden Council. One reminder of the past (although very much part of the present) is the enormous and venerable London Plane (P. x acerifolia) that dominates the gardens. This magnificent tree, possibly a remnant from the original development, will have witnessed many changes around the Square and tolerated a varied cocktail of noxious fumes during its centuries on the spot. In its shadow are two equally remarkable Oriental Planes (P. oriental). This pair – of indeterminate age – are Bonsai trees in comparison. Although much smaller and easier to miss they have arguably more character; they exhibit pot-bellied, burry old boles reminiscient of ancient oaks and have elegantly spreading canopies developed over decades, if that is a suitably ageing unit to use. 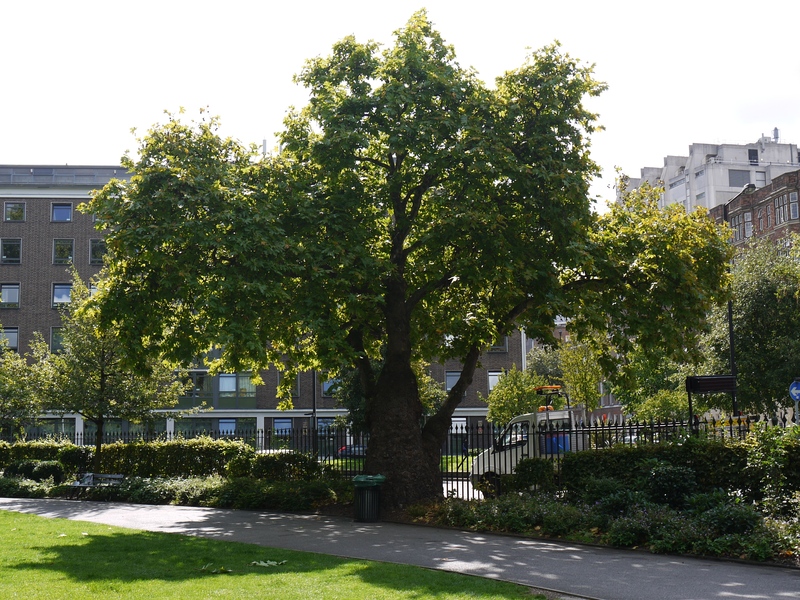 My two gnarled ancestors of the London Plane are typical in their growth – according to my research the Oriental Plane can be a large tree sometimes attaining the great size common in its progeny, but often becomes multistemmed and spreading. I am very fond of these two trees, they are not like other public trees in central London which have to take on trim and uniform shapes defined by triennial pruning regimes laid down by local authorities fearful of the potential damage a splintered arboreal limb might cause a no-win-no-fee solicitor or his clients. Take a look at my Plane tree set on Flickr. Thanks Larry – I’m glad you enjoyed it!